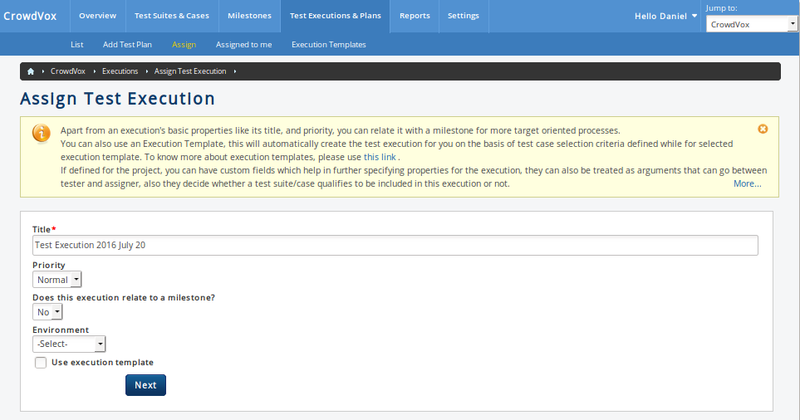 In Testcollab, you can create test execution either from suites dashboard on the basis of test cases being listed; or you can also use "Create Execution" option available on "Test Executions" menu. Adding a Test Execution is a 2 step process and it involves adding a new Test Execution, which is followed by the process of assigning the new Test Execution to a tester. 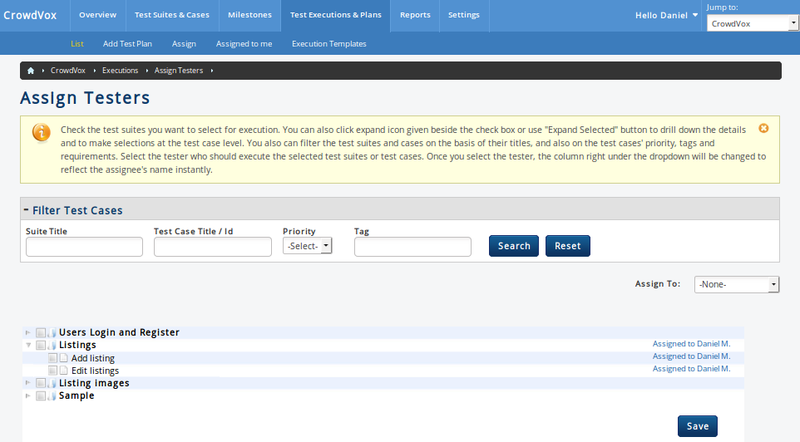 User can reach to this screen by either using Test Execution ->Assign option or by using Allocate New Test Execution on Milestone's view page. 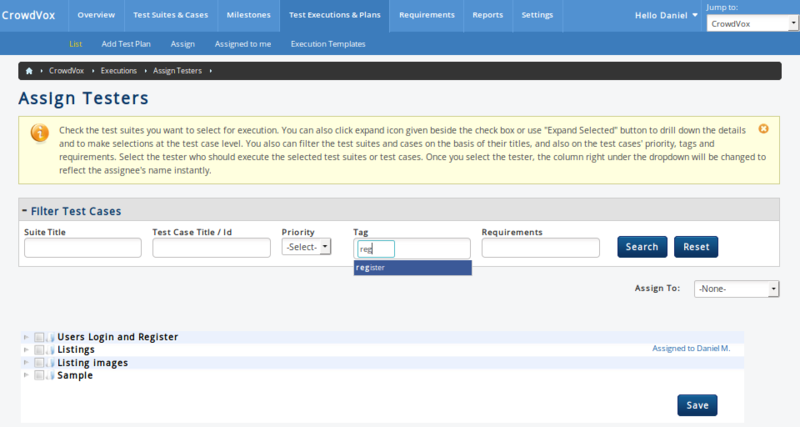 If test execution is to be created under a test plan then "Add Execution" option can be used. When an authorized user opts to Assign a new Test Execution record, a form is made available to enter information. A check box, to know if execution template should be used. Here custom fields can be seen as additional parameters that may be set to control the execution of a test. To know more about custom fields see this. Here title is the only mandatory field. This process helps an authorized user assign test cases to the testers collectively or individually, that are going to be the part of either a newly created Test Execution or of a pre-existing Test Execution. Here user (assigner) is required to clearly define the relation between a tester and the test cases. A tester can be a member in selected project having permission to execute tests, an administrator, or a remote executor defined under application settings. User can assign one or more test cases that may belong to one or more test suites present in the selected project. Once the assignment is done then only it would be possible to get the tests executed (or atleast set their status). Test suites present under the project will be available for selection (Clicking the test suite's name would expand the list of test cases defined under the selected test suite. 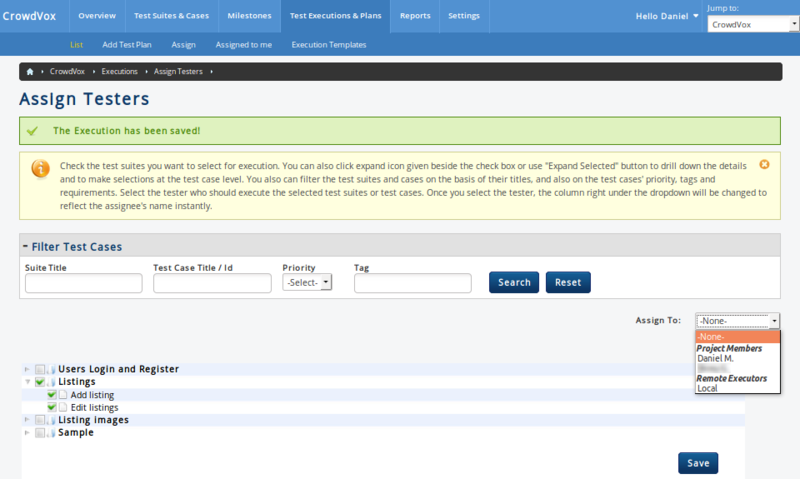 User can now select test cases individually or collectively by checking their boxes). 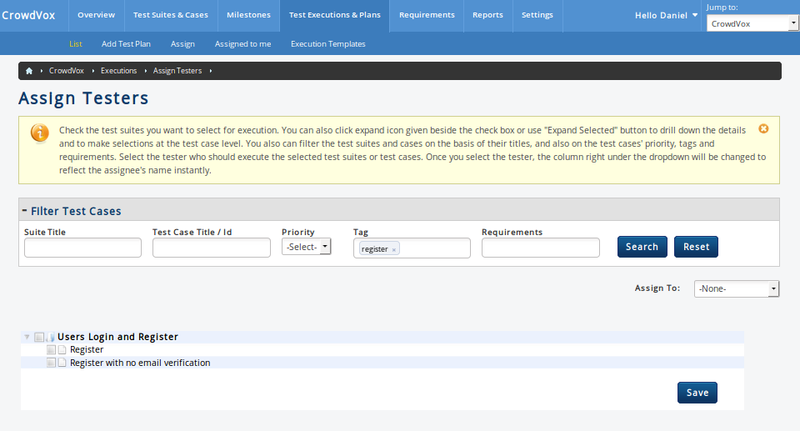 Once the cases are selected, user can select one of the testers (from Assign To drop down) for the assignment. After selection, one can see the testers' names next to the test suites' and/or test cases' names. If there are some test cases for which testers have earlier been assigned, then for each such test case the name of assigned tester will be shown next to it in the test cases list box (until reassigned to someone else). For convenience user can filter the test cases to be assigned, on the basis of their suite's title, test cases title, priority, linked tags and requirements. Once the filter is applied, the list of test cases and their respective suites will be restricted to the criteria selected. When filter is applied, Reset option can be used to remove the applied filters and show all cases and suites. After assigning, if email notification for assignment of a test has been enabled by administrator, then the same would be sent to assignees.